This sentence may not have the same punch to it as Cuba Gooding Jr.’s legendary Jerry Maguire exclamation, but in the car industry, it carries a great deal of meaning. 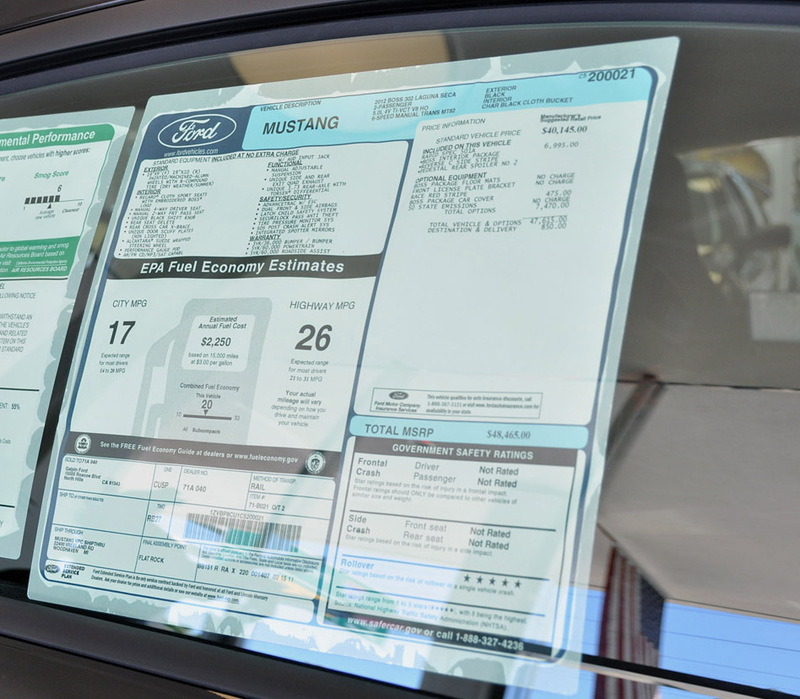 A new car’s window sticker, which lists information like the manufacturer’s suggested retail price (MSRP), engine and transmission specifications, standard equipment and warranty details, optional equipment and pricing, fuel economy ratings, and crash test ratings, is actually an incredibly important document for protecting consumers. Prior to the Automobile Information Disclosure Act of 1958, dealerships were allowed to use hidden charges and misleading advertising to take advantage of consumers. Fully-loaded, expensive cars could be adorned with the price tag of a base model, and fees associated with state and federal taxes and the transportation of the vehicle could be manipulated to tack even more money onto the price of a vehicle. That era of deceptive dealership practices ended thanks to the Senate Subcommittee on Automobile Marketing Practices, and in particular its chairman, Oklahoma Senator Michael Monroney. Yes, almost 60 years later, dealerships and customers alike refer to the window sticker by the name of the Senator who helped push for it: Monroney. Yet many people don’t know that once window sticker bill was proposed, dealerships fought just as hard for its passing as consumers. Car dealerships viewed the predatory practices that Monroney sought to outlaw as harmful to the long-term success of the automotive industry; if a handful of dealerships are allowed to mislead their customers, it runs the risk of making consumers mistrust all car dealerships. The passing of Monroney’s bill leveled the playing field for dealerships that wanted to do things the right way, and for that reason we are very grateful for the Oklahoma Senator’s gift to automotive history. So next time you see a car’s window sticker, remember that it does much more than educate you about a vehicle’s safety ratings: window stickers protect consumers and dealerships, and serve as a living legacy for the trailblazing men and women who dedicated their lives to helping Americans get a fair deal when car shopping. Not bad for a slip of paper!